[FTC Standard Disclaimer] This post is sponsored by Smithfield. When I went to Smithfield VA last year, I learned about both the town and the company's storied history. So I wasn't surprised to see them team up with Yuengling, America's oldest brewery, to bring a little excitement to your grill this Summer. 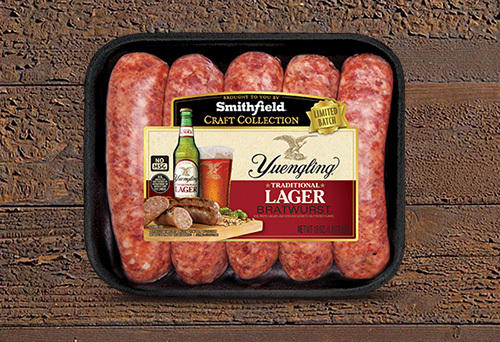 Smithfield has introduced their new Craft Collection by rolling out their Yuengling Traditional Lager Bratwursts. Alexis found these this week at the Kroger on Northshore Drive in Knoxville. 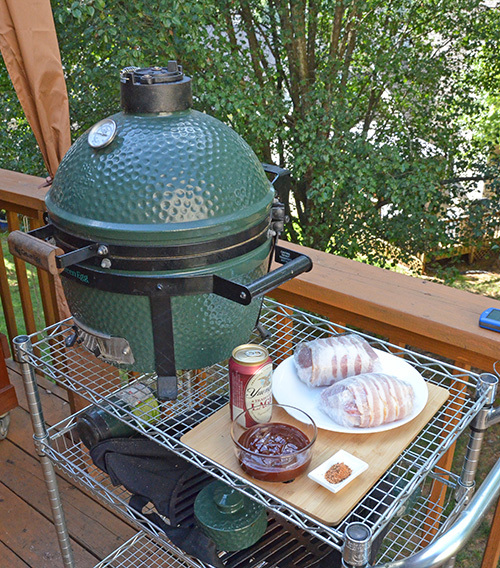 Of course, the first thing that we did with them was grill some on grill over medium low heat for 15-20 minutes. They were just what you want in a brat - juicy, well seasoned, and a kiss of beer. 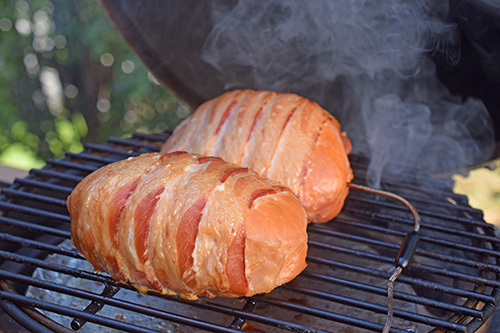 Then I had an idea for a recipe - stuff center cut boneless pork chops with the bratwurst sausage, then wrap them with Smithfield Hometown Original bacon, and smoke them on the grill. I know, smoking usually takes hours, right? But this is a quick smoke at a bit higher temperature, so you get all of that smokehouse flavor in just an hour and a half. 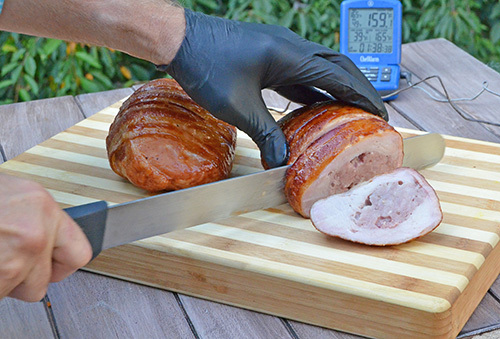 Your cooking times are going to vary depending on how thick of pork chops you use and how thick you stuff them, so always go by your internal temperature instead of time and cooking temperature. 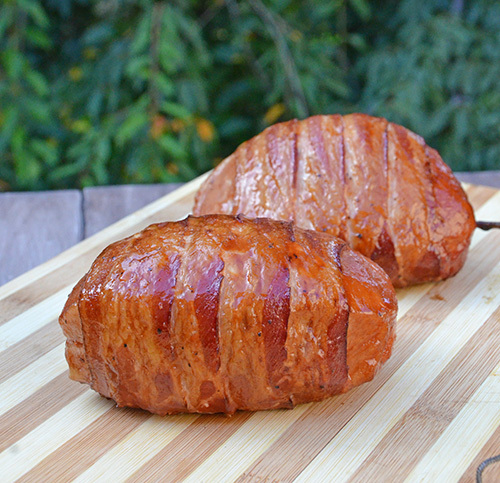 A pork trifecta - center cut boneless pork chops stuffed with Smithfield's Yuengling Traditional Lager Bratwurst and then wrapped with bacon. Normally wouldn't cook pork chops past 145 but the fat from the bacon and sausage makes it okay. Prepare the pork chops. 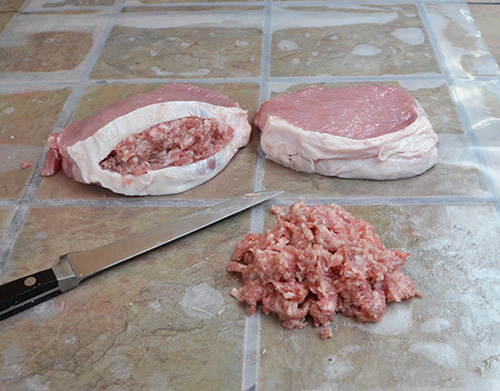 Use a sharp boning knife to carefully cut a pocket into the side of each pork chop. Stuff each chop with one fourth of the bulk bratwursts. 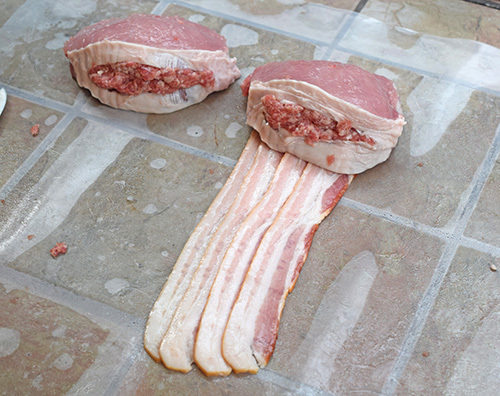 Line up 3 to 4 strips of bacon, place a pork chop on them and then roll it up, wrapping the chop. Repeat for the other chops. Set up your grill for indirect heat and preheat the grill to 300°f. For a kamado grill, this will be using a heat deflector. For a charcoal grill, bank the coals to one side and leave a void, above which the food will be placed. For a gas grill, you will have the burner directly under the food turned off. For an extra boost of flavor, add wood chunks to the fire. Place the pork chops over indirect heat. Close the lid and allow the pork chops to slow roast to an internal temperature of 145°f, about 45 minutes to 1 hour. Glaze the chops. Mix together the BBQ Sauce and lager. 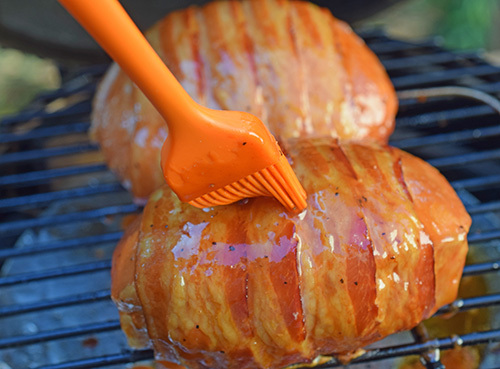 Brush on the glaze, close the lid and allow to cook until the pork chops reach an internal temperature of 165°f, about 15 to 20 more minutes. Pork Chops - You might notice that we didn't season the pork except for the glaze. I figured that the bacon and sausage were seasoning. But if you want to up the ante a bit, Alexis pointed out that you could use Smithfield's Hickory Smoked Brown Sugar pork chops. 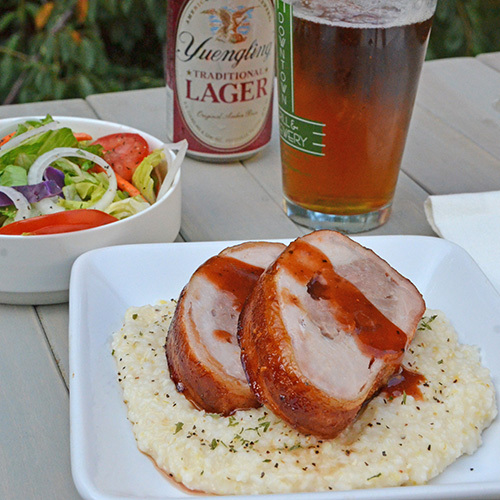 We doubled up on the Smithfield and Yuengling by using Smithfield bacon for the wrap and using Yuengling lager to cut BBQ sauce into a glaze. Be careful when you are cutting the pocket in the pork chop. 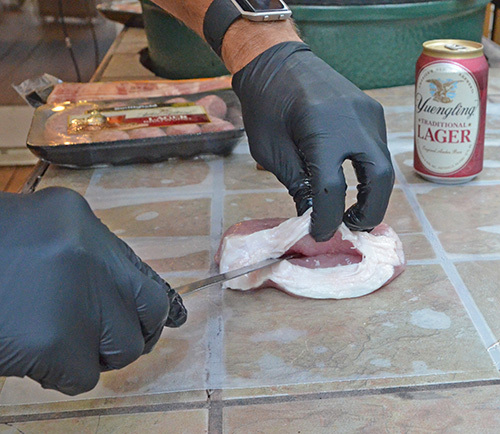 Using a razor sharp knife makes it much easier. One thing I think that a lot of people miss out on with brats is thinking beyond the bun. Just like Italian sausage, bratwurst is a great sausage to take out of the casing and use for a stuffing like this or browned in a pan for other dishes. Brats aren't just for buns! 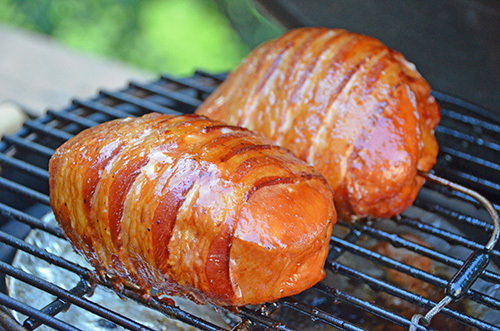 The easiest way to wrap these is to lay 3 or 4 strips of bacon so that they over lap. Place the stuffed chop at one end and then roll it up. Voila! 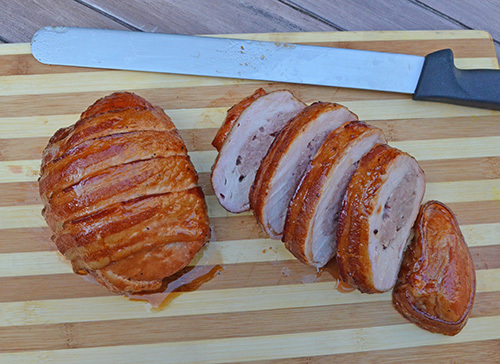 Pork stuffed with pork and wrapped with pork. Here's a tip. 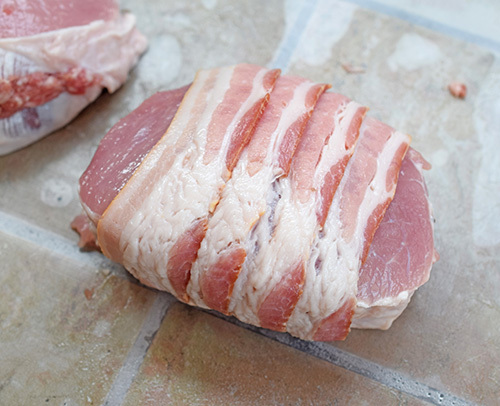 You know how a lot of times when cook bacon wrapped anything, the bacon will sometimes curl away from your food? 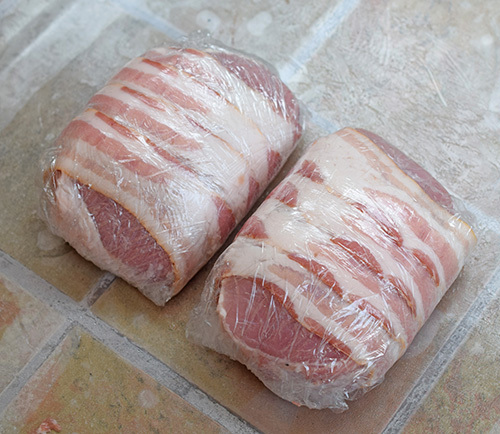 I wrapped these in plastic wrap overnight, it really helps the bacon stick to the food. You can cook these on any type of grill. This night my weapon of choice was a small kamado grill. I love grilling out on these Summer nights when it is light late into the evening. I added a chunk of hickory wood but cherry, pecan, apple, or oak are all excellent types of wood for this recipe. You can also use wood chips if you prefer. 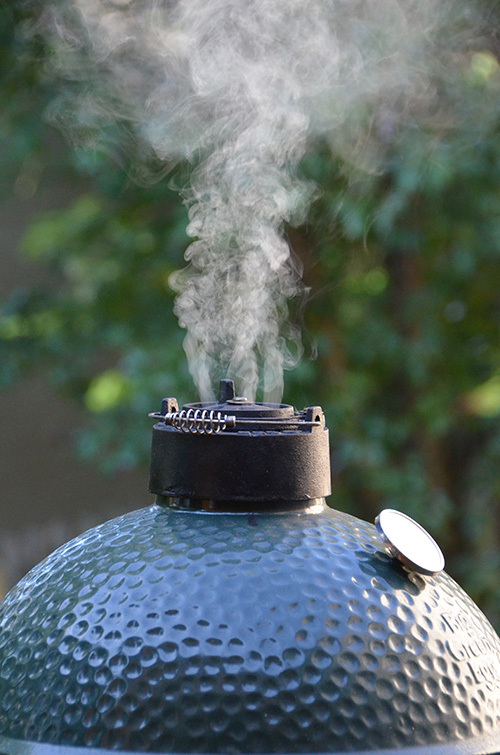 In addition to the smoke flavor, the wood also adds color to your meat. Most commercial BBQ sauces are too thick for my preferences. So I like to cut them with liquids like stock, fruit juice, or beer to thin them out. This makes them more of a glaze and also makes them less likely to burn. Like all roasted and grilled meats, I like to let mine rest for 5 minutes when they are done. Normally, I only cook my pork chops to an internal temperature of 145°f. But the sausage needs to be cooked to 165°f which is fine, because the fat in that and the bacon will keep the pork chop from drying out. For portion size, I guess that one person could eat a whole stuffed pork chop. But we slice ours for smaller portions and I think it makes a better presentation. 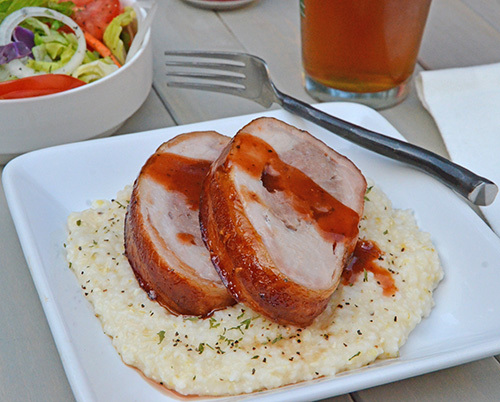 I served mine on a bed of smoked cheese grits and drizzled some of the extra sauce over the slices. Absolutely fantastic. 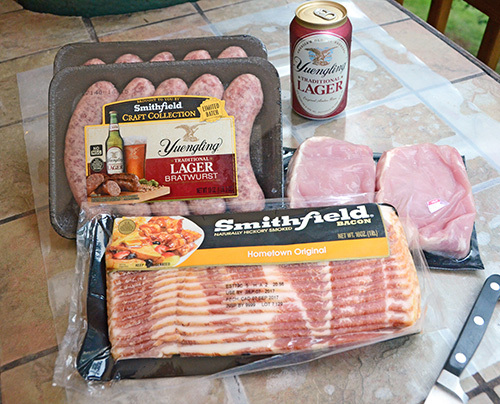 You can find Smithfield Craft Collection Yuengling Traditional Lager Bratwurst at your local Kroger.